Kuo's tenth book includes some of his best poems over a fifty year career. "Alex was my first writing teacher, and 25 years later is still my teacher. His vision is sure and uncompromising. I love this book." "I happen to believe that there are a lot of good poets around at present, but a poet like Alex Kuo, who possesses a highly developed moral sense and a bitter honesty, is rare at any time and especially in this time. We need him." "Line after line, I am surprised and moved by the way his language connects the rhythms of our collective memory, imagination and chance." 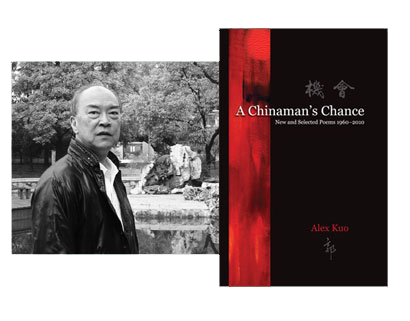 "Alex Kuo's A Chinaman's Chance startles its reader out of complacency. Here is writing that doesn't coddle and that keeps one engrossed, questioning, thoroughly awake. Kuo's poem-stories deftly resist attempts at a too narrow classification of style--beyond it being his own--simultaneously suggesting while artfully sidestepping any overassumption of autobiography by blending what reads like personal history with inarguable emotional truths." "Alex Kuo has given us...a book we can be with for many years...[a] book that feeds my mind and touches my spiritual life." Born in Boston, Alex Kuo spent most of World War II in China, followed by eight years in Hong Kong before returning to the United States. He has lived and worked most of his adult life in Idaho and Washington beginning in 1956 when he signed on a forest fire crew for U.S.F.S. Since 1963 he has taught writing and cultural studies at several colleges and universties on both sides of the Pacific. His first published poems appeared in 1961 in Castalia, Descant and American Weave. Recipient of three National Endowment for the Arts fellowships, he has also been awarded the Lingnan American Studies and Senior Fulbright lectureships, a Rockefeller Bellagio residency, and several research grants. He has been appointed distinguished writer-in-residence at Fudan University , Knox College and Mercy Corps. In 2002 Lipstick and Other Stories received the American Book Award, and in 2010 he received the Alumni Achievement Award from Knox College.